This creamy non-dairy nut milk beverage is surprisingly drinkable, with a rather light and fluid 1% milk consistency. 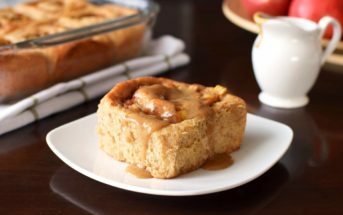 The flavor is a touch nutty in the Unsweetened varieties, but easily dominated by the light sugars in the Sweetened varieties for a taste that's a little harder to discern from dairy milk. It's actually quite a treat! All versions seem quite versatile for everyday eats and recipes, but be warned that the packaging for the Sweetened and Unsweetened selections look nearly identical. When I think of Royal Hawaiian Orchards, I’m overcome by the delicious memories of macadamia treats. My mother-in-law religiously sent boxes of their goodies to us whenever they would visit Hawaii. But this tropical company is making a big new splash with their first beverage product: dairy-free macadamia milk. 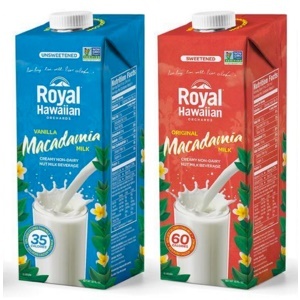 Royal Hawaiian Orchards Macadamia Milk is a creamy milk beverage that I would liken to a nutty non-dairy upgrade over 1% dairy milk. It looks surprisingly thin when poured, and is fairly low in fat (about 3 to 4.5 grams per cup). However, it has a full-bodied consistency that’s a little rich, yet quite drinkable. I didn’t think the taste of this flavor was neutral, but it wasn’t overpowering either. 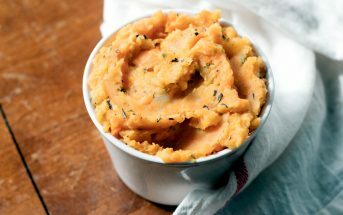 It has a light macadamia flavor that is pleasant, but not sweet, and could be a solid backdrop for savory recipes. Overall, the flavor profile was simple, well-balanced and versatile. Royal Hawaiian opted to use a lighter hand with the vanilla than most other non-dairy milk brands. The natural flavoring adds just enough warm sweetness to perfectly compliment granola and smoothies. Do you remember the days of sprinkling sugar on healthy cereals because your parents wouldn’t buy the fun ones? This macadamia milk took me back to those days. It tasted identical to the sugar-infused milk in those bowls of Grape Nuts. Wow, this flavor is shockingly indulgent, and just a smidgen less sweet than a vanilla milkshake, I wouldn’t hesitate to use it in baked goods or for lower fat creamy desserts like pudding. But I do have a word of warning. The packaging of Royal Hawaiian Orchards Macadamia Milk can be a bit confusing. The Sweetened varieties look nearly identical to the Unsweetened varieties. The design and color is the same, with the Vanillas in blue and the Originals in red. The only two differences are the “Unsweetened” vs “Sweetened” stated at the very top (which is easy to misread!) and the calorie count stamped on the front. 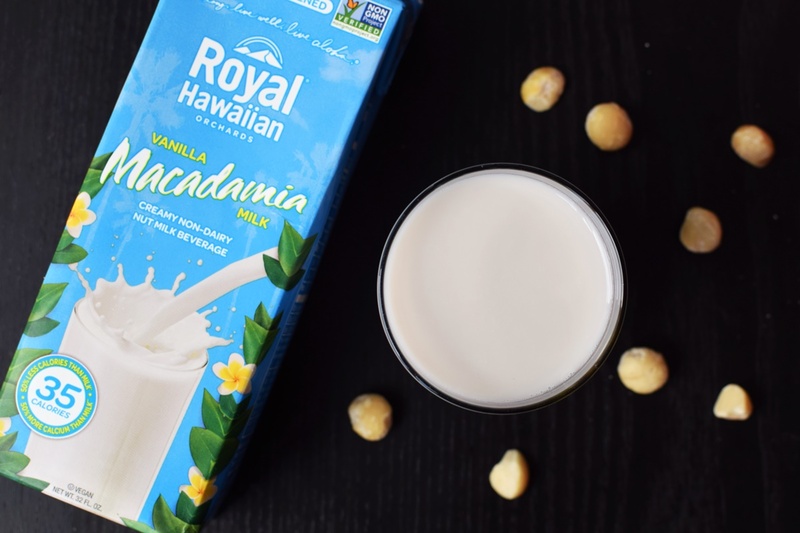 Nutrition Fact Notes: Royal Hawaiian Orchards Macadamia Milk is generously fortified with calcium (50%), vitamin D (25%) and vitamin E (50%). It is void of protein, but is also carrageenan-free and low sugar (0 to 7 grams per cup). Certifications: Royal Hawaiian Orchards Macadamia Milk is Certified Kosher Parve and Non-GMO Verified. 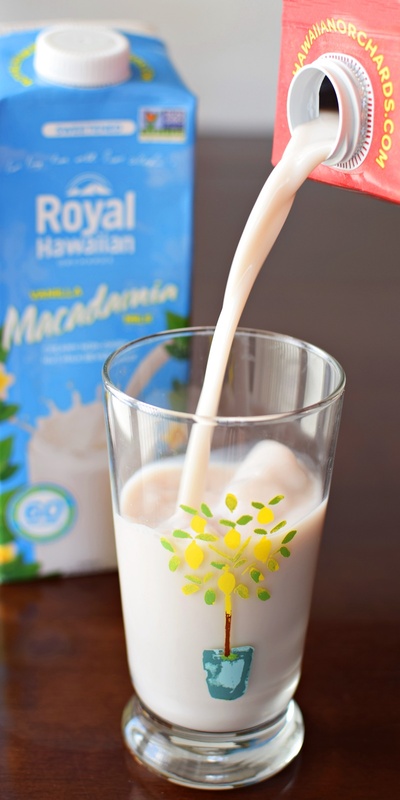 Dietary Notes: By ingredients, Royal Hawaiian Orchards Macadamia Milk is dairy-free / non-dairy, egg-free, gluten-free, peanut-free, soy-free, vegan / plant-based, and vegetarian. Nonetheless, always read the ingredient statement and check with the company on their manufacturing processes for all varieties if potential allergen cross-contamination is an issue for you. Processes and labeling are subject to change at any time for any company / product. For More Product Information: Visit the Royal Hawaiian Orchards website at royalhawaiianorchards.com. THANK you. I opened up my sweetened royal Hawaiian vanilla macadamia milk (blue) and it looks brown like chocolate milk. Is it suppose to be white? Yikes, it shouldn’t look like chocolate milk! It isn’t purely white though. It’s kind of a tan/gray color. See my photo above – the color has been balanced in that photo so that is the actual milk beverage color. I love how you describe the consistency as closer to 1% milk. 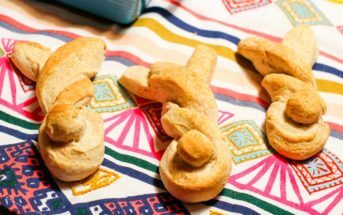 My toddler is dairy free, while the rest of the family is not, so this could make an excellent option for the whole family! I do my best to share the little things so people can decide if it’s a fit for them. Hopefully it is for your family Emily! Very intrigued by these milks, Alisa, and can’t wait to try them! Thanks so much for sharing this review! My pleasure Shirley! I hope you find it soon – I think it’s a good one! So happy to have found your site. I can not wait to try this!!! I remember falling in love with macadamia nuts on my first trip to Hawaii. They were covered in chocolate, so it was easy to do! Thanks for the review. I’ll keep my eyes open!